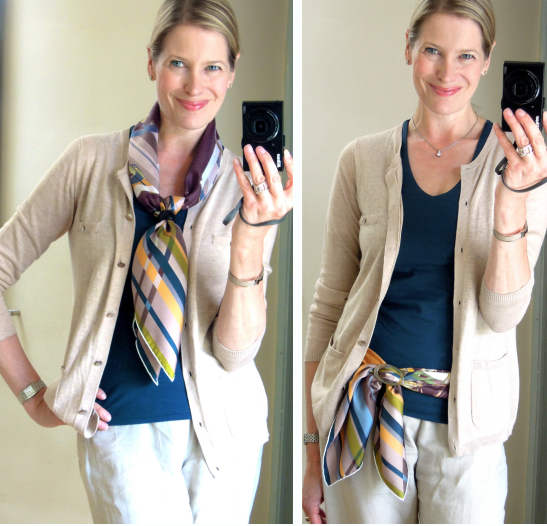 Left: Fold your scarf in the basic bias, place around your neck and make a simple knot. Slide both scarf ends through an Anneau Infini scarf ring (you can use any round and smooth ring instead) and push the ring up against the simple knot. Tres chic and class as usual dear Mai Tai. Merci, chère Monica. Have a wonderful weekend! Maitai, I luff your capsule collection. 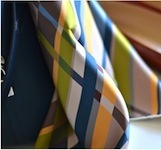 I am trying to discover the history of my scarves and figure out who designed them and whether they are re-issues. I know the ecuries and elephant (carp a-whatsy) ones are. Are tropique and mexique new or reissues? I love the way scarves remind you of the time in your life you bought them and who you were with etc. I blame you for my new addiction. I concur - it is an addiction. My meagre scarf collection is slowly expanding, thanks to Maitai's influence. Unfortunately I work in a very creative office (graffic designers in beachwear and men in strange skirt arrangements) but I am undeterred. I always aim for a polished look and accessories regardless of the workplace. There's one other lady who wears H scarves too so we stick together. Safety in numbers and all that. Thanks, Maitai, for your lovely inspiration as usual. I very much agree with you (in terms of blaming MaiTai for the scarf addiction, but I must say that she has opened up a tremendous new world of combining the outfits and colours for me, therefore she is a great teacher). I live myself in the similar working environment like Susan (men in majority, who even don't know what/who Hermes might be), however, no fellow lady I could share the love for H with. Having said that, I have not given up and wear my scarves regardless of the environment and people, enjoying them very much. Your 70 scarves are all new designs. I love this scarf on you! The colors are so perfect for you. On another note, will be getting strawberries and prosecco today to give your cocktail recipe a whirl. Hope the Rossini and evening were both bellissimo, my dear Marla! That marine blue top is beautiful on you! Love it too, many thanks Gina! Très jolie capsule tons très doux . J adore l idée du foulard en ceinture comme la chaleur est enfin arrivée c est une belle idée pour continuer a porter nos foulard. This scarf looks beautiful when paired with the oatmeal and marine blue! What other colors do you think you will wear with it? I love the look of it tied around your slim waist. Lovely. Scarf twins with you on this one, dear, and also camera twins as well. :-) It's a great little camera, one that I always make sure I'm rarely without when DH and I are out for the evening or on holiday. Have a lovely upcoming weekend, dear. Double twin hugs to you, dearest CS! Agree with you on the camera, and so glad you got the Photo Finish. Apart from the marine blue and oatmeal above, it’s fabulous with white, navy, denim, light blue, brown, teal, taupe, storm grey, khaki, rust, mustard....have fun playing! Have a splendid weekend, dear Mai Tai. We are in the midst of another monster storm which should subside by tomorrow. For now, it's Strawberry Bellinis and a good book! Oh no, not another storm! Hope it came and went without leaving a trail. 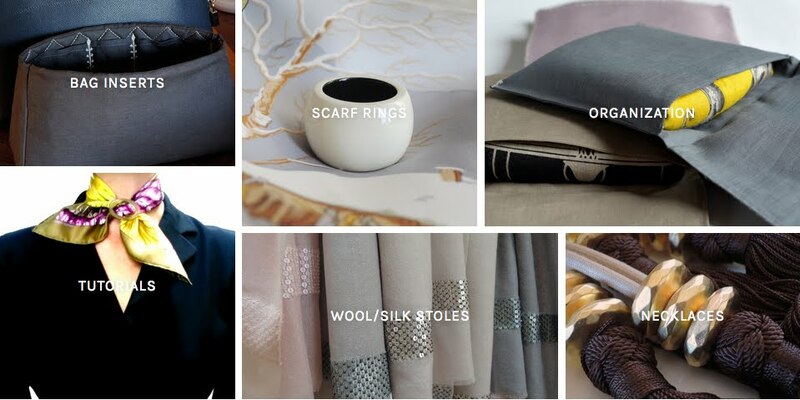 Love Etoupe, it’s a perfect neutral, and fabulous color all year round. Choosing a favorite bag is an impossible task indeed, but if I could only pick one, it would currently be my etoupe 35 Kelly! A beautiful, harmonious outfit again. I have been thinking lately - what is actually the role of white colour when combining the things? Should any outfit have something white in order to look harmonious and fresh (whatever - shirt, top, cardigan, trousers, scarf detail, jewelery)? Or I think so because I like white colour? What a lovely Summer post, my dearest MaiTai. 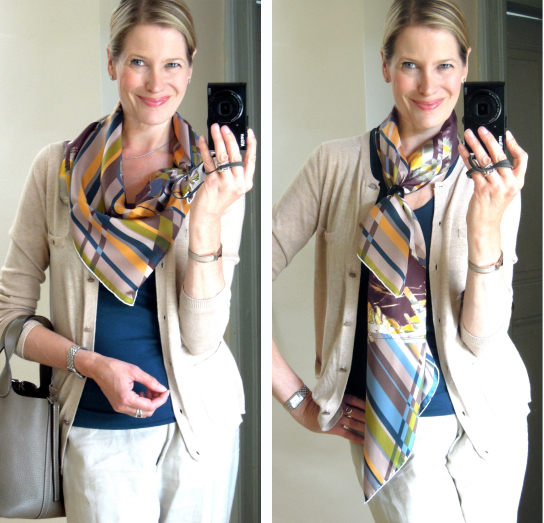 The ´Photo Finish`is such a happy scarf and combines so well with the lovely top. All ways of tying it look great but the last ones are my favourites. Love your Oran sandals. 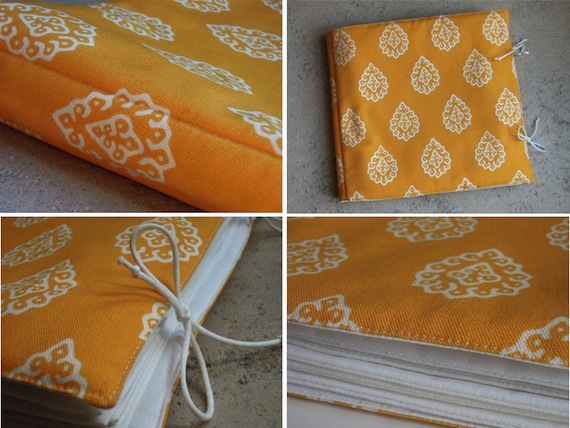 Such a beautiful and very chic colourway! Congratulations on the pretty new Travel Pochette. Perfect for Spring and Summer in such a warm colour. Thank you, my dear, once again for the recipe. 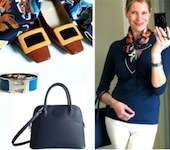 Love this post showing the different ways to tie your Photo Finish every one is perfect, and the colours with your new summer clothes are perfection. Just today I wore my PF for the first time with my MT scarf ring loved it since you know we are twins.